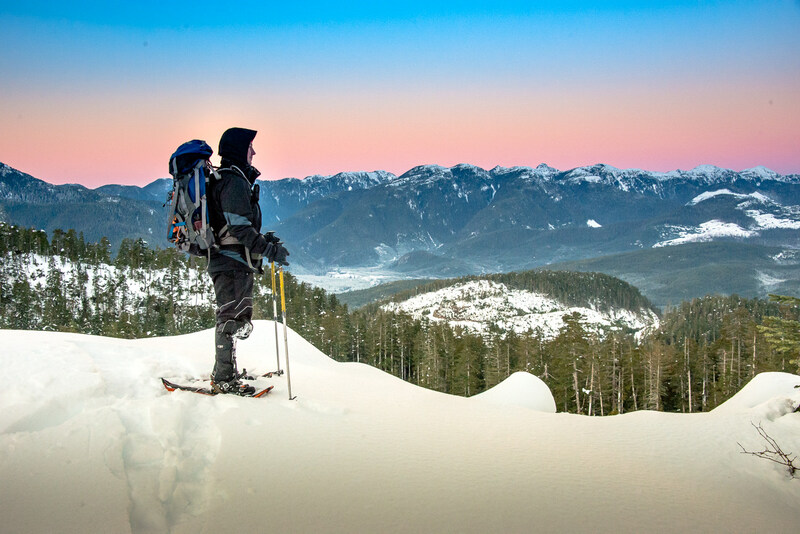 Nothing screams “winter break” more than an overnighter in Vancouver Island’s Alpine. Complete with camping on snow, and a longish logging road approach to the start of the route, this trip will remain in my memory for a long time. 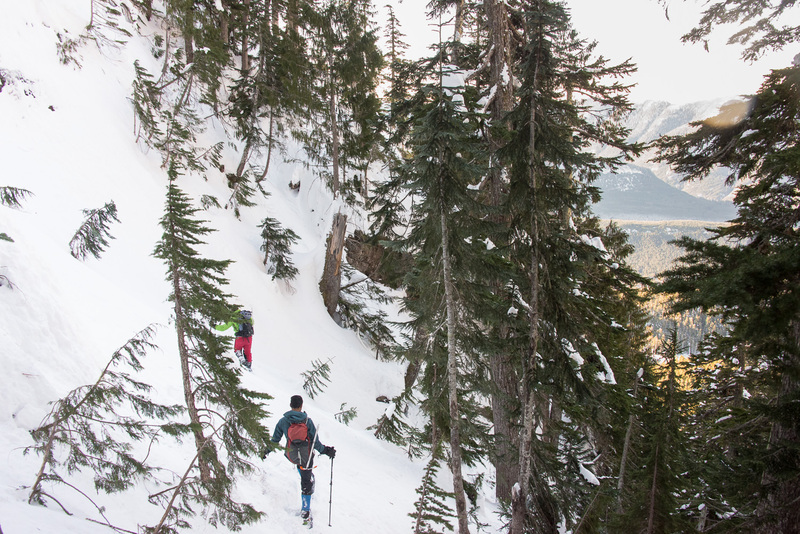 It is a long-standing Island Mountain Ramblers’ tradition to make the most of New Year’s Day, celebrating with a winter hike up Mt. Arrowsmith’s Judges Route, a semi-annual trip we call Katzenjammer. This year, though, I attended a different trip; Phil Jackson hosted a Ramblers trip to Pinder Peak, a seldom-visited peak in the Province Range. 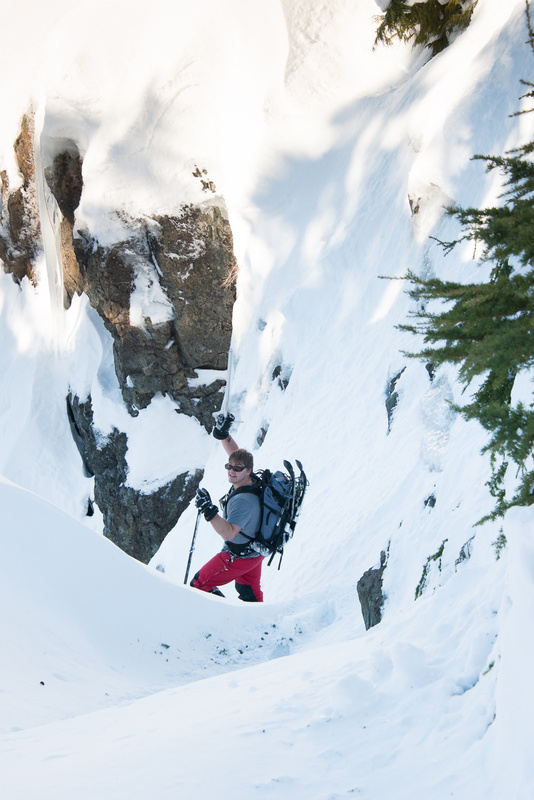 It sees few ascents, let alone winter ascents! 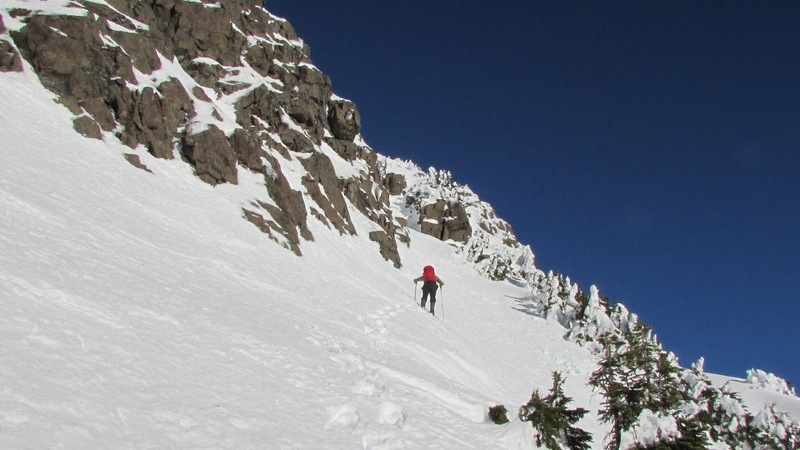 Four participants enjoyed cold weather camping and fair snowshoe conditions, attempting this summit. Bright and early on January 1st, 2016, three of us departed Phil’s house on the long trek to Zeballos Mainline turnoff on Highway 19. We met Rishi at the turnoff, and set out to the trailhead in two vehicles. 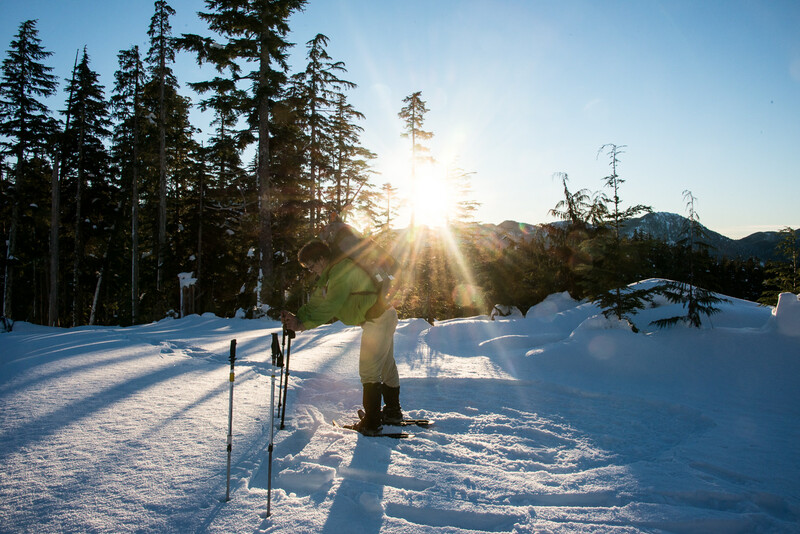 The seasonal conditions made the drive to the trailhead an adventure unto itself. 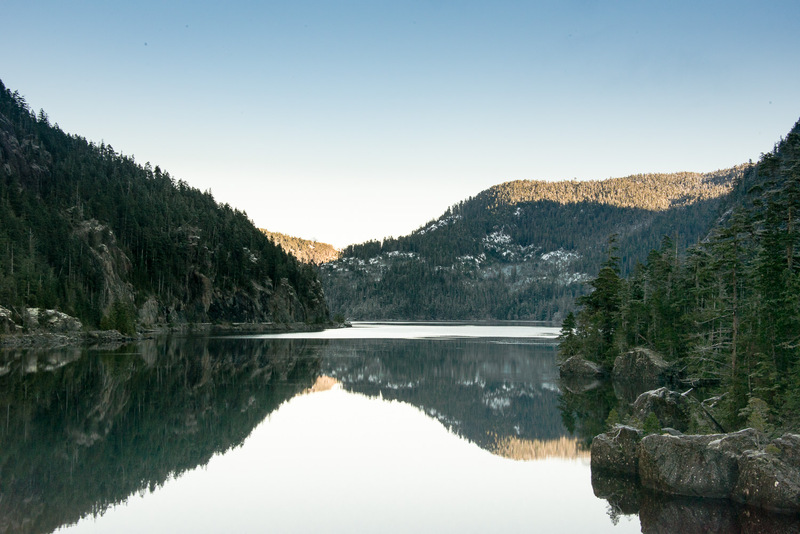 The road edges Atluck Lake, which offers amazing views. In certain areas the face of the mountain terminates in the water, and in others small islets grace the narrows between the two shores, with the vistas beyond. The road is in good condition but my car didn’t make it to the trailhead; even Rishi’s 4×4 struggled at one point. Around the 500 metre mark, snow depth on the road piled up to six inches with a hard crust on the surface. I tested some chains I recently acquired, and they did a great job of pulling my Outback up the hill; but the car didn’t have the power to break the crust and maintain the forward momentum needed to crest the hill. It took several runs to reach the top and at that point the truck carried on, I left my car at 500m. I’ve played a terrible game before with my car and the snow, but I didn’t want to risk it this time. Just 500 metres short of the trailhead, we were stopped by a downed tree, and had to leave the truck and continue on foot to the deactivated logging road. The road snakes back and forth, using switchback to gain elevation. Ascending, snow conditions varied in quality and depth. At the lower elevations, the snow was shallow with a thin crust; at higher elevations, a thick crust sat atop as much as 65cm of snow. 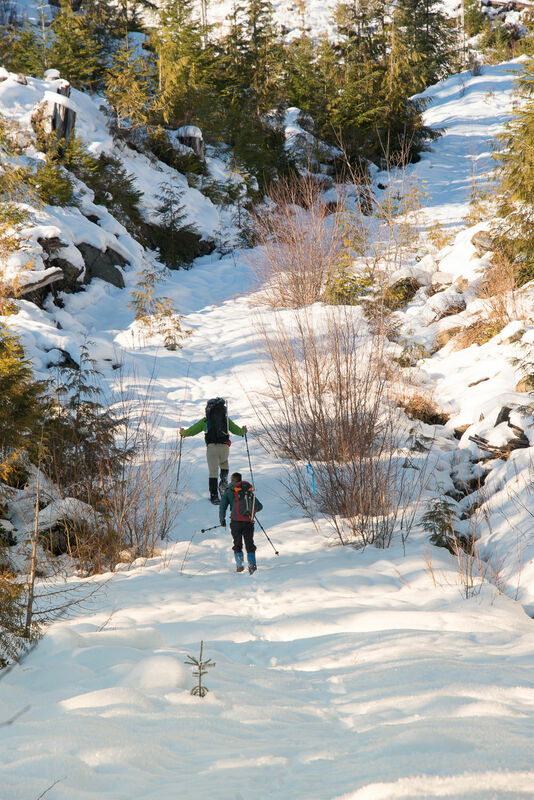 Phil and I each found flotation an issue, even with our 30″ snowshoes. Most steps included a delayed sink of four to six inches. This was probably to be expected as we each carried more than 250 pounds between gear and body weight, and it made the walk a bit of a slog. 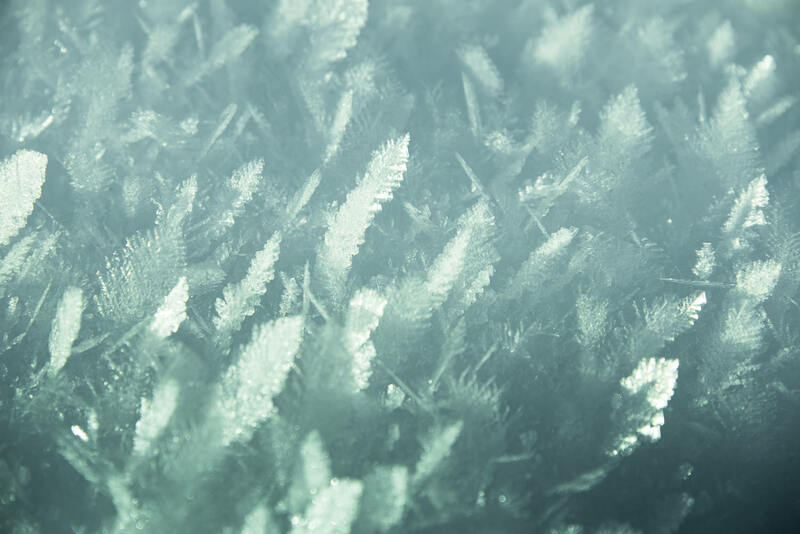 Fortunately, the sunny conditions and the crystals on the snow made for an enchanting walk up the mountain! We arrived at the end of the road (750m) at 4:30 pm, just in time for sunset. As we made camp in the dwindling light, Pinder and its horn glowed in the warm evening sunlight. Phil and Rick identified features that would mark our route for the next day; they had both hiked this mountain in late 2015. With the sun gone, we didn’t last long. After eating our meals we jumped into our sleeping bags. Though we were in bed before seven, we stayed up swapping winter-tales for a few hours and admiring the cascade of stars from the doors of our tents. We woke well before dawn on January 2nd. At 6:30 I rousted myself but refused to exit my sleeping bag. I boiled water for my meal from inside my bag; Saigon Chicken Noodles (I forgot my coffee and breakfasts in the car!). By 8:00 am, just before sunrise, we were walking the remaining 100 metres of the logging road, with our eyes on the ridge high above. Rick inspecting the sunrise, before the early start. 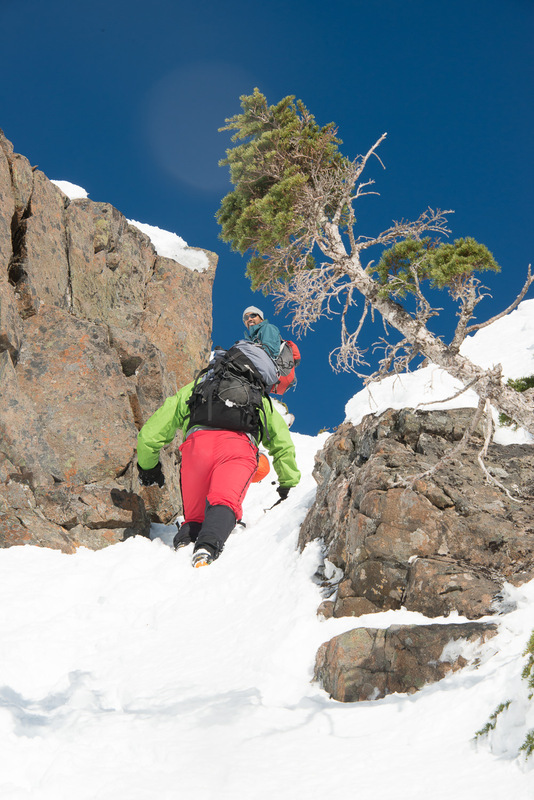 There are a number of commonly-used routes to access the ridge above, most notably the gully. We steered clear of it for fear of water running below the surface of the snow. Our route led across a short section of logging slash, into the woods and up the southwest slopes. We picked up a lightly-flagged route and followed it as we ascended the valley wall toward the southwest ridge, south of the horn. The deep snow made for easy crossing of the terrain, though care was needed to avoid traps. Rishi called it best when he said the narrative for the day was “man vs. treewell”. At one time or another during the day, each of us was swallowed by the snow: some to the waist, and others to the shoulders. Mostly, however, the snow compressed less than six inches as we made our way up and through the woods. Our goal was to hit the southwest ridge and traverse below the horn to the saddle between the main summit and the horn. The slope gradually leads to the base of a short but very steep gully, the biggest challenge for obtaining the ridge. Though it is only 35 metres of elevation, in the snow it took a near-heroic effort, aided by tree holds and acrobatics to haul ourselves up. Phil and I swung out and over to a ledge, but the other two bulldozed their way up the deep snow and eventually rejoined us at 1150 metres elevation. I will note that we found a piece of flagging in the gully, marking it as a route used in the summer; Phil and Rick used this same gully on their trip a few weeks earlier when the ground was bare, and described it as steep but easy. 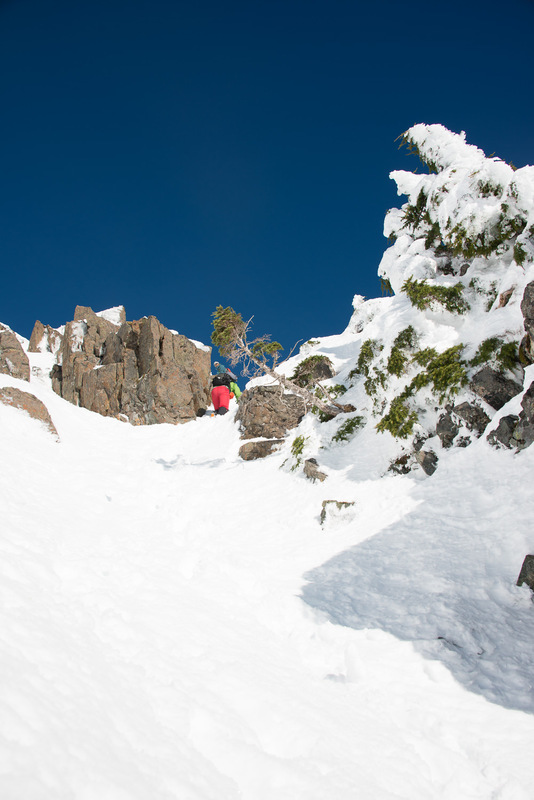 Once up the gully, the snow conditions improved greatly. The crust firmed, and we sank only a small amount with each step. By the time we reached the crest of the ridge, it was close to noon. 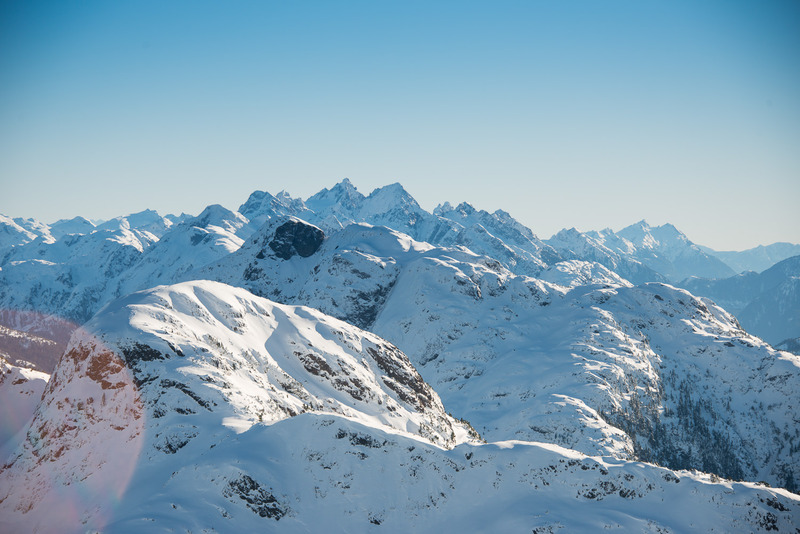 The sun beat down, and we enjoyed views of the surrounding peaks, including the H’aite and Sutton Ranges. Peaks EVERYWHERE! 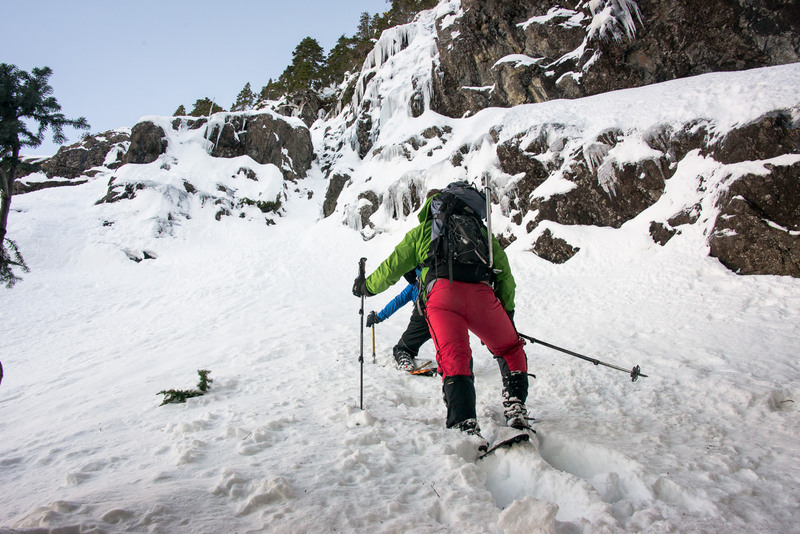 It was getting late in the day and we realized that we didn’t have time to make the main summit; furthermore, the route we intended to use looked very much like an avalanche gully, steep and with lots of sliding snow! 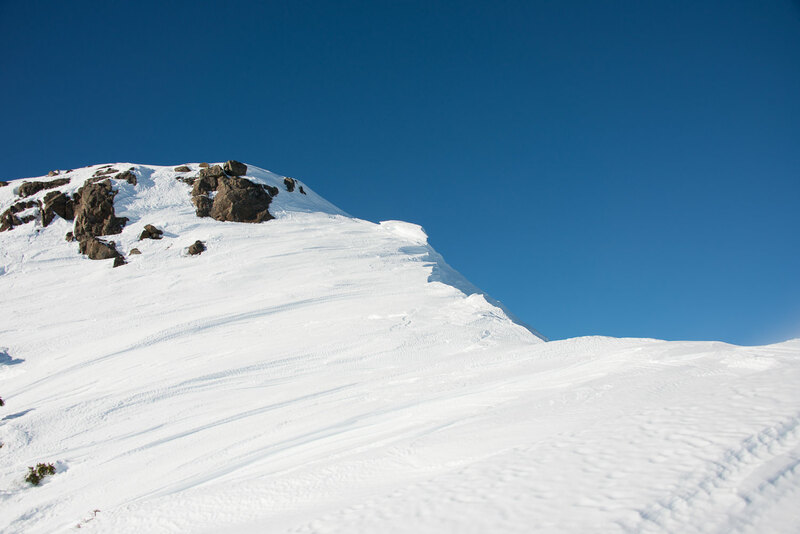 We measured our options and decided to tackle Pinder’s Horn; only a few metres lower than the main summit, yet requiring a very different approach. On the ridge, my mind was fixated on the descent. It’s been nearly two years since I was in similar conditions, and this was my first time leading in them. 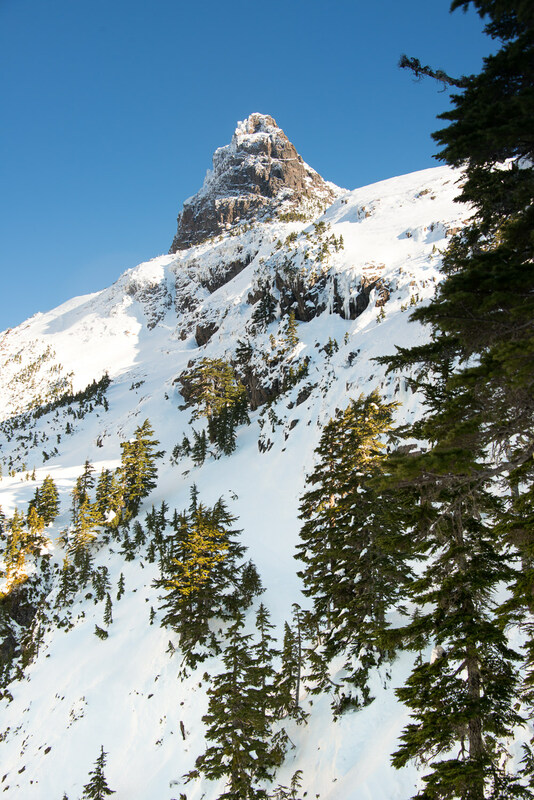 We stopped at the upper ridge and put our crampons on; the snow was windblown, shallow and slippery. Sitting at home in my chair, with the knowledge that we made it down safe and without incident, I can see now that the final 30 metres of elevation would likely have taken us less than 20 minutes to achieve. However, we didn’t even try. On the upper ridge, we enjoyed the views of the surrounding ranges. I barely even considered the final approach to the summit. Considering what we had come up already, it was probably much easier. We descended. Uneventfully. The condition of the snow, once below the steepest 10 metre section, was great for plunge stepping and we didn’t put our snowshoes back on until we had descended nearly 700 metres. From the lower ridge, we took a different route. Descending into the snow bowl between Pinder Peak and the horn to the main gully, we followed that route down until we rejoined our original route, and followed that back to our tents. We didn’t have to descend the steep gully we had ascended. We arrived at the tents around 4:00 pm, just as the sun set. We packed in twilight and then kept headlamps out; unfortunately, mine was dead (when I checked it the night before departure, I must have left it on). We descended quickly from the camp to the truck, arriving just after 7:00 pm. Thankfully, the white of the snow created just enough visibility for safe walking, and the road is the obvious route. For those who are looking to give this peak a try, remember that my route was in deep snow. Many of the routes we traveled are likely not accessible in the summer. Furthermore, though I consider our route up a good route, our route down is questionable; I would advise against using it. At one point we had to hop over a large hole through the snow, to rejoin the gully. View the full album of 43 images taken on this hike..
Great story Matthew, nice pics- Pinder sure looks a lot different than when i climbed it last May!